SAN FRANCISCO, April 12, 2018 /PRNewswire/ -- ABM Innovation Summit - Demandbase, the leader in Account-Based Marketing (ABM), today announced the launch of ABM Analytics within the ABM Platform, leveraging the company's patented account identification technology. ABM Analytics will help marketers view performance of their ABM initiatives from advertising to pipeline and revenue, to understand the progression of their most valuable accounts across the buying cycle. 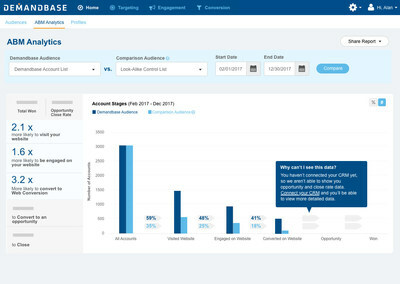 And unlike basic reporting tools, the new functionality allows marketers to compare the performance of different audiences or account lists, evaluate the impact of specific programs, and even compare the performance of different vendors—all within a single platform. Additional layers of insights expose trend and velocity data, and surface recommendations for next best actions to drive higher conversion rates through the funnel. "The ability to measure and articulate the effectiveness and impact of ABM programs is important to long-term ABM success," said Alisa Groocock, Research Director, SiriusDecisions. "ABM solutions that bring extended measurement visibility can better support critical decision-making, and as a result, enable ABM programs to grow more quickly." ABM Analytics is part of Demandbase's ABM Platform and is designed to deliver insights to decision-makers and practitioners tasked with driving an ABM strategy, from awareness and engagement to conversion and closed revenue. Using the solution, marketers can monitor the health of their ABM strategies by examining the progress of their most valued accounts through the buying cycle; create side-by-side comparisons of audiences with different revenue ranges, employee sizes or verticals to understand how their segments perform at every stage of the funnel; understand the performance of individual marketing tactics such as advertising or direct mail; diagnose problems and opportunities along the customer journey and take targeted actions to improve performance; and build credibility throughout the organization by sharing transparent ABM progress reports. "For years, B2B marketers have struggled to connect disparate data sitting at agencies, in their web log files and CRM to measure the true impact of their marketing programs," said Chris Golec, CEO of Demandbase. "Our new analytics functionality leverages the best practices from some of the world's most sophisticated B2B marketers and brings them to life for every company, no matter where they are on their ABM journey." "Demandbase's ABM Analytics has been a game changer for Alfresco," said Sydney Sloan, CMO of Alfresco. 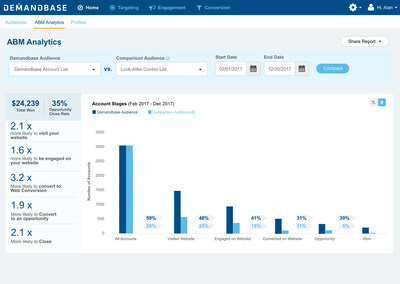 "We are now able to see a clear comparison within our target audiences for the first time, resulting in 25 percent higher engagement from accounts that were identified using intent data from Demandbase's Account Selection." For more information on ABM Analytics, please visit our blog post, "The 4 Dimensions of Account-Based Measurement."